The “Alice” table lamp by Budri of Italy is designed by Cristina Celestino and is a homage to Lewis Carroll’s novel, Alice’s Adventures in Wonderland. “Following the White Rabbit, the heroine enters an imaginary underground world made up of surreal concepts and paradoxes, where she has the most unlikely misadventures. This distorted parallel universe is full of changes of scale, where the values of objects or characters are transformed,” says a spokesman for Budri. According to him, in the design of the Alice table lamp, the variation in scale takes the form of a subtle reworking of the relationship between function, form, material and proportions. 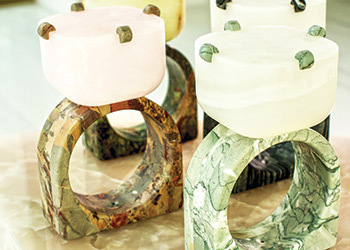 “At first glance, the lamp looks like a ring with an extra-large stone gem: an oversize item of table jewellery produced in shaped marble. On closer inspection, the object reveals a unique lighting capability, which plays around with the rules of perception,” he says. The base of the Alice lamp is available in different types of marble: Blackwood (a material with black streaks); Serracolene Versailles (an exquisite French material named after the Palace of Versailles); Rain Forest Green (an Indian material in shades of green); and Verde Antigua (a white marble with pale green vein patterning). The gems are all in onyx, in pastel shades. The lamp is not operated by means of a touch system. “It is operated by a gesture that calls to mind the act of putting on the ring; when a hand is placed inside and brushed over its base, the onyx gem illuminates to reveal a new design identity,” the spokesman indicates. An Axor Uno collection tap ... with a Zero handle. Axor, a brand of the Germany-based Hansgrohe Group has drawn inspiration from pipes to define two purist style variations in its new Axor Uno bathroom collection, created in collaboration with the Stuttgart-based Phoenix Design studio. Axor Uno pursues the uncompromising design principles of the original Purist movement with consistent construction: two precisely-shaped cylinders joined together at a right angle. The precise contours and the raised proportions in the golden ratio of the taps are their defining stylistic features, lending them a special aura and giving them a sleek and elegant look in any setting. The collection comprises more than 70 products for washbasins, showers and bathtubs. Operation of the Axor Uno taps has been reduced to the essential: the flow of water is started or stopped by pressing the Select button, by turning the so-called “Zero” handle, or by lifting the ergonomically shaped loop handle. 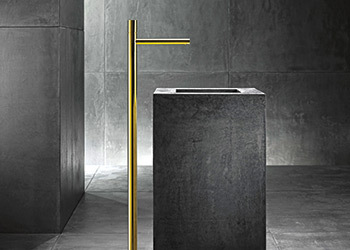 “Implemented at the highest technological levels, Axor Uno is the quintessence of Purism: clean, minimalistic, subtle. This collection embodies the most fascinating shapes of Purism, both in form and in function,” Silke Giessler, head of Axor brand marketing, explains. 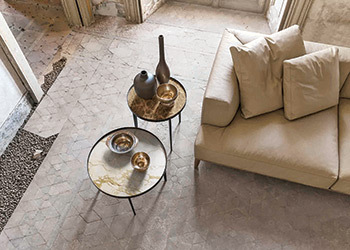 The Sirio coffee table ... from Alivar. Alivar, an Italian company known for its refined and minimal design, has unveiled the Céline armchair and Sirio coffee table, both part of its Home Project collection and designed by Giuseppe Bavuso. Céline is an armchair with a cosy shape made of wood and coated with polyurethane rubber and fibre. The model resembles the classic bergère in form, revisited in a contemporary way. “Elegance is defined by details: the visible stitching denotes a high-level crafting manufacture and gives to the furniture a sophisticated look,” says a company spokesman. Comfort is ensured by the seat in polyurethane foam and fibre with a memory foam layer. Another important detail is the structure that can be realised in varnished oak or chromed steel (painted or stainless in Peltrox finish or black nickel). Sirio a set of coffee tables that can be combined together or used individually, characterised by extreme functionality and the modernity of precious materials. It has legs made of cast aluminium and a frame in painted stainless steel, polished, chrome, black nickel or painted, while the top is made of thermo-treated oak wedges, lacquered MDF (medium-density fibreboard) glossy or matt or in marble. The tray-like shape of the top and lightness of the support base are the result of a refined balance between technology and high design.